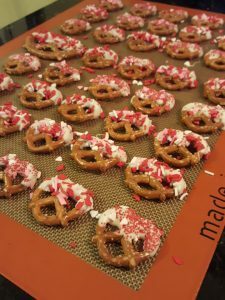 These pretzels dipped in white chocolate and sprinkles are some of the simplest treats you can make for your sweetie, friends, or family members this Valentine’s Day. 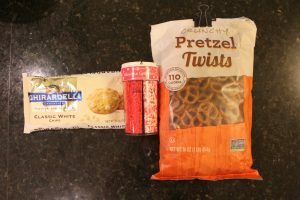 Ingredients: White chocolate chips, sprinkles of your choosing, & pretzels (size and shape to your liking). That’s it! 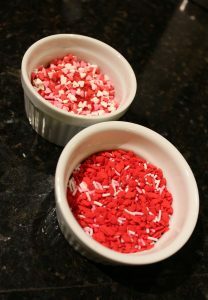 Place the sprinkles in small ramekins. Microwave the white chocolate chips for 30 seconds, stir and then microwave another 30 seconds if needed. 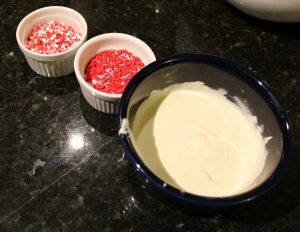 Start by dipping the pretzels in the white chocolate, allow to drip for a few seconds so you don’t have excess chocolate. Then dip the pretzel covered in chocolate into the sprinkles. Lay on parchment paper or on a Silpat baking sheet to harden. It only takes a few minutes for the chocolate to harden. Then enjoy! Super simple and very tasty!